Elena Ferrante is one of the greatest novelists of our time. Read her novels and don’t worry about who she is: you will be entranced by her writing. Frantumaglia is a riveting compilation, over the course of her writing career, of Elena Ferrante’s letters to her publisher, interviews with editors and journalists, and responses to readers' questions. For fans of Ferrante, and for fans of writing, this is essential reading. Her comments have the ring of truth and the power of wisdom. This is a woman who not only knows her own mind, she can see deep into ours, too. The Frantumaglia project (as it is referred to by her publishers) has evolved over the many years of Elena Ferrante’s writing career. She defines the word ‘frantumaglia’ as a ‘jumble of fragments’ and it is an expression her mother used to describe the disturbing sensation of being torn apart by contradictory emotions. The project is presented here in English for the first time in three parts. The first was originally published over a decade ago and was intended as a sort of appendix to her first two novels, Troubling Love and Days of Abandonment. Those who have read these two books will gain the most from the letters and interviews collected here. I particularly loved a long, unpublished passage from Days of Abandonment that formed part of an incredibly insightful and thoughtful response Ferrante gave in an interview with an Italian magazine. The second part was added to the original after her third novel, The Lost Daughter, was published and the third section largely comprises interviews she was required to give to publishers all over the world who bought the rights to the Neapolitan Quartet. 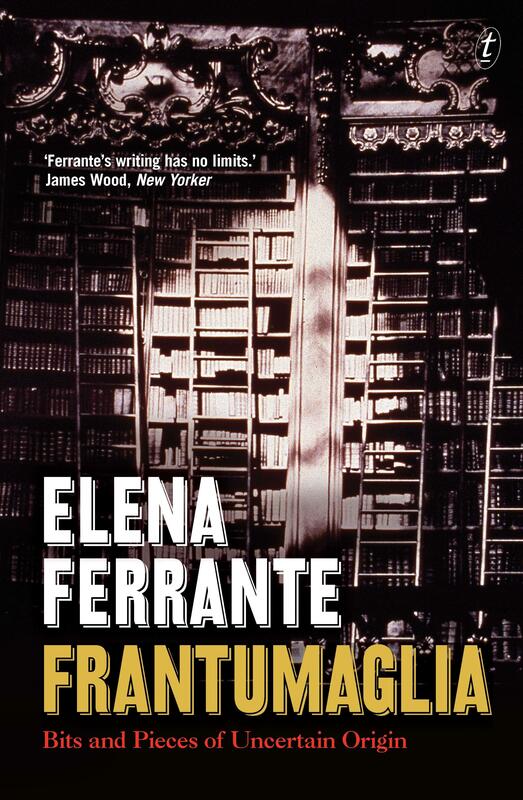 The material collected here further reveals Ferrante as a remarkable writer and deeply original thinker across a range of subjects but particularly on writing, the importance of fiction, feminism and motherhood. One hopes that the recent ‘unmasking’ of her identity will not eclipse the importance of this book; certainly, true fans will not be disappointed. She addresses her reasons for privacy within these pages intelligently and convincingly and cautions ‘I remain Ferrante or I no longer publish’. This extraordinary collection of frantumaglia gives us far greater insight into her novels than any speculation about her ‘real’ identity.